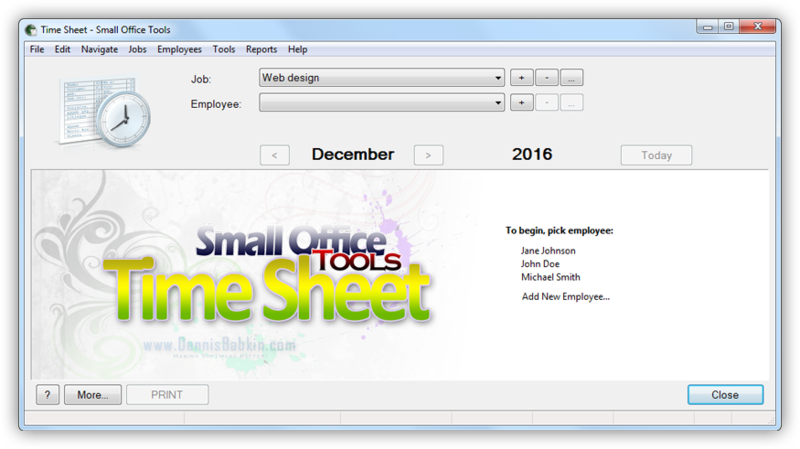 The Time Sheet app is a part of the Small Office Tools suite that was designed to provide specialized, easy-to-use software for a small business office. The Time Sheet program strives to help small business employees to keep track of their work hours by providing means to enter, monitor and generate reports of their time worked. Read on for details on how to use it. Desktop version: Before you can take advantage of the Time Sheet program, you need to download its installer. It comes packaged in a ZIP archive. After you've downloaded and opened it (and passed all of the "mandatory" Windows warnings), you will need to run the installer file. Then follow on-screen instructions to install the Time Sheet app. After that you're done, and can now delete the installer package that you downloaded earlier. Windows 10: Go to Start -> Settings -> System -> Apps & Features and locate "Time Sheet - Small Office Tools" in the list. Then click it and select Uninstall. Follow on screen instructions to finish uninstallation. Windows 8 & earlier: Go to Start -> Control Panel -> Programs and Features and locate "Time Sheet - Small Office Tools" in the list. Click it and select Uninstall button above. Follow on screen instructions to finish uninstallation. Windows Store version: Go to Start -> Settings -> System -> Apps & Features and locate "Time Sheet - Small Office Tools" in the list. Then click it and select Uninstall. Follow on screen instructions to finish uninstallation. Desktop version: If a registered copy of the Time Sheet program contained at least one administrator account, such account login will be required to uninstall the program. Note that Windows Store version of the Time Sheet program does not support this feature. In that case, uninstallation will proceed without requiring an administrative user password. An administrative password will not be required either if the Time Sheet program database does not contain any administrative accounts, or if the Time Sheet program itself was not registered. Select any administrative account from the list and provide that account password to proceed with uninstallation. If you forgot your administrator password, cancel uninstallation and run back the Time Sheet program. Refer to this FAQ on how to reset your password. 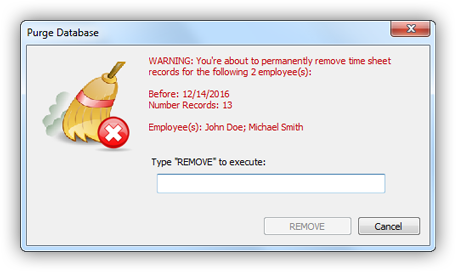 WARNING: Uninstalling the Time Sheet program will remove all of the employee time sheet records, as well as other generated data! In case you want to read additional details about uninstallation of older versions of the Time Sheet app, please refer to this FAQ. Although you can fully configure the new job record, at this stage all that is required is its name. Click ADD button to add a new job record to the Time Sheet program. You will be able to modify it later. At this stage you will need to provide employee name and password (read here for more details) and click ADD button to add a new employee account. Now the Time Sheet program is set up & ready for use. The Time Sheet program can automatically load up the time sheet for the last logged in employee. Check the Preferences for details. The Time Sheet program first loads the job record that is marked to be loaded by default in the job settings. 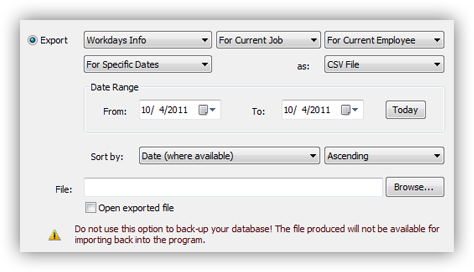 If no job record is specified to load by default, the last job record used in the program will be loaded instead. 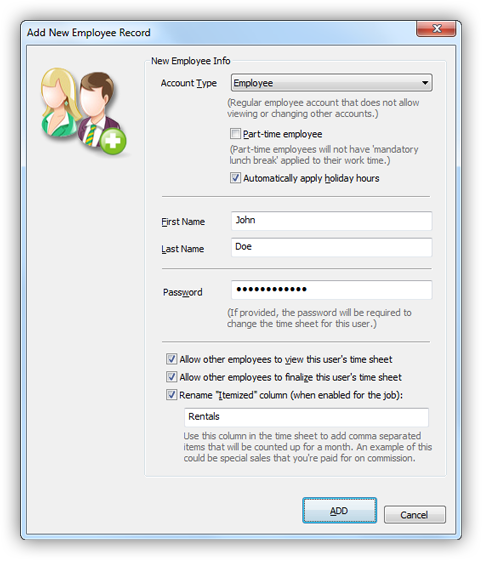 When you select an employee account the Time Sheet program window will change to display that employee's time sheet record. The time sheet record loaded will be specific for the selected job record. Alternatively you can select a different account from the employee drop-down list to open that user's account & time record. Logged in administrators are allowed to open user accounts of other non-administrative users for read-only access, as well as logged in accountants are allowed to open user accounts of employees for read-only access. For instance, for an administrator to be able to open and modify settings for other user accounts, he or she needs to log in first, and then using the employee selector drop-down list pick another non-administrative user account to gain access to. After that the administrator will be able to change that user's settings, or delete their account. Note that in this case an administrator will not be able to modify that user's time sheet. Similarly, accountants can log in to other employee accounts for viewing, although they will not be able to change those user account settings. Select a user, then provide user password, and click OK. Or hit Enter key on the keyboard to proceed. User passwords are case-sensitive, meaning that small and capital letters are treated differently. If you forgot your password, ask an administrator to change it for you. If your account is an administrator, or if there's no administrator account set up yet, you can use an option to "force removal of employee account" to delete your user account. You can then create a new account with the new password. Other than that there's no other means to restore user passwords! Note that an administrative user login is required to remove a job record. Such login will be omitted if there's no administrative users currently present in the Time Sheet program database. Note that an administrative user login is required to add or remove an employee account. Such login will be omitted if there's no administrative users currently present in the Time Sheet program database. The "-" button may be disabled if there's no currently logged in user. The "..." button may be disabled if an employee record is password protected for editing and the password has not been entered yet, or if the currently logged in user does not have access to the employee's settings. Get more options by clicking the More button at the bottom left corner of the Time Sheet window. Main menu on top of the Time Sheet program window provides a full subset of commands available in the app. The language and format of dates, time and numbers displayed by the Time Sheet program will be specific for your location. Read here for details on changing the currently logged in user. The "..." button to edit current employee account may be disabled if an employee record is password protected for editing and the password has not been entered yet, or if the currently logged in user does not have access to the employee's settings. 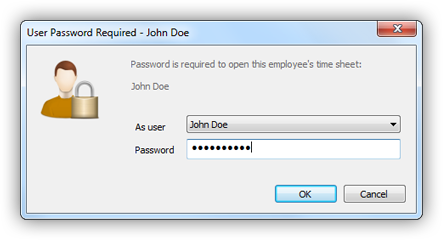 The password controls are not displayed if the currently selected employee record does not have a password, or if that employee already entered their password. To begin entering your password from anywhere in the Time Sheet program's main window press Ctrl+W keyboard shortcut. When you finish entering the password, either hit Enter on the keyboard, or click the ">" button on the right off the password field. If the password is accepted the "READ-ONLY" message above the time sheet controls, as well as the password controls will disappear. If the password that was entered into the password field is incorrect, the field will flash several times with red to indicate failure. In case the currently selected time sheet is password protected, the "Log off" button makes the Time Sheet program forget that employee's password, or log them off. The currently selected time sheet is unloaded and the program displays the welcome screen. The navigation controls show month and year that the current time sheet is displayed for. You can use the "<" and ">" buttons on each side to advance one month (or one year) forward or backward, respectively. Note that the "<" and ">" buttons for the year are initially disabled. You can enable them in the program's Preferences. Use "Today" button to make the Time Sheet program switch focus to today's record in the currently selected employee time sheet. The language and format of dates and time will be specific for your location. Ctrl+Right Arrow to go to the next month. Ctrl+Left Arrow to go to the previous month. Ctrl+Shift+Right Arrow to go to the next year. Ctrl+Shirt+Left Arrow to go to the previous year. Ctrl+T to switch to today. You can resize column widths by dragging the separators between them in the column header. Date column - contains the date (including the weekday) for each day line of the time sheet. Certain days, such as Sundays and holidays are displayed with different colors. You can customize color theme of the time sheet controls for the current job record by clicking the "..." button in the Job selection controls, or by going to Jobs -> Edit Job in the main menu. You can set or customize holidays for your specific location in Preferences. Time In column - displays the time an employee started their workday. This field is editable. You can begin editing this field, either by double-clicking it with the mouse, or by highlighting it first and then hitting Enter on the keyboard, or by entering any of the ten digit keys on the keyboard. To finish entering the time, either press Enter on the keyboard, or click somewhere else in the Time Sheet window. To cancel the entered time, press the Esc key on the keyboard. The time format will be specific for your location. Lunch In column - displays the time an employee started their lunch break. (You can leave this field empty if you didn't have a lunch break.) This field is editable. You can begin editing this field, either by double-clicking it with the mouse, or by highlighting it first and then hitting Enter on the keyboard, or by entering any of the ten digit keys on the keyboard. To finish entering the time, either press Enter on the keyboard, or click somewhere else in the Time Sheet window. To cancel the entered time, press the Esc key on the keyboard. Lunch Out column - displays the time an employee ended their lunch break. (You can leave this field empty if you didn't have a lunch break.) This field is editable. You can begin editing this field, either by double-clicking it with the mouse, or by highlighting it first and then hitting Enter on the keyboard, or by entering any of the ten digit keys on the keyboard. To finish entering the time, either press Enter on the keyboard, or click somewhere else in the Time Sheet window. To cancel the entered time, press the Esc key on the keyboard. Time Out column - displays the time an employee ended their workday. This field is editable. You can begin editing this field, either by double-clicking it with the mouse, or by highlighting it first and then hitting Enter on the keyboard, or by entering any of the ten digit keys on the keyboard. To finish entering the time, either press Enter on the keyboard, or click somewhere else in the Time Sheet window. To cancel the entered time, press the Esc key on the keyboard. Hrs column - contains the value of hours worked for the day, calculated automatically from the times entered in "Time In", "Lunch In", "Lunch Out" and "Time Out" columns. Over column - contains the value of overtime hours worked for the day, calculated automatically from the times entered in "Time In", "Lunch In", "Lunch Out" and "Time Out" columns. The Time Sheet program considers time worked as overtime if it falls outside of a workday defined in the settings for the current job. In case "mandatory lunch break" is specified in the settings for the currently selected job, and the employee is not part-time, the value in this column may contain an asterisk (*) to indicate that the time was deducted to account for the mandatory lunch break. This field is editable. You can begin editing this field, either by double-clicking it with the mouse, or by highlighting it first and then hitting Enter on the keyboard, or by pressing a letter, a number or a symbol key on the keyboard. To finish editing, either press Enter on the keyboard, or click somewhere else in the Time Sheet window. To cancel the edit, press the Esc key on the keyboard. Not Enabled Not Enabled Will show as "Itemized"
Not Enabled Enabled Will show as "Itemized"
Comments column - lets you specify any comment that you'd like to include for the workday. You can begin editing this field, either by double-clicking it with the mouse, or by highlighting it first and then hitting Enter on the keyboard, or by pressing a letter, a number or a symbol key on the keyboard. To finish editing, either press Enter on the keyboard, or click somewhere else in the Time Sheet window. To cancel the edit, press the Esc key on the keyboard. The contents of the "Comments" column can be excluded from the Employee Time Record in the Preferences. You can customize color theme for the current job record by clicking the "..." button in the Job selection controls, or by going to Jobs -> Edit Job in the main menu. You can set up or edit holidays for your location in the Preferences. Use Keyboard Arrow Keys to move the time sheet cursor among the fields in the time sheet. Use Page Up and Page Down Keyboard Keys to move the time sheet cursor one page up or down along the fields of the time sheet, respectively. Use Home and End Keyboard Keys to move the time sheet cursor to the top or to the bottom of the currently selected month, respectively. Left click any of the time sheet fields with the mouse to switch the time sheet cursor to that field. Use scroll-wheel on the mouse to scroll the time sheet up or down. Double-click any of the time sheet fields to enter the editing mode. In this mode you can change the value of the time sheet field. To finish the editing mode, either press Enter on the keyboard, or click somewhere else in the Time Sheet window. To cancel the editing mode without saving changes done to the field, press Esc key on the keyboard. Not all fields can be edited. Editting will be disabled if the time sheet record was finalized, or if the mode that the time sheet was opened in was read-only. The Time Sheet program saves all changes in the database "as you go", thus eliminating the need for you to manually save changes later with the "Save" command. Use Enter Keyboard Key, or Digit Keys from 0 to 9 to enter the editing mode for the time sheet fields displaying hours. To finish the editing mode, either press Enter on the keyboard, or click somewhere else in the Time Sheet window. To cancel the editing mode without saving changes done to the field, press Esc key on the keyboard. Use Letter, Digit or Symbol Keyboard Keys to enter the editing mode for the Comments or Itemized column fields. To finish the editing mode, either press Enter on the keyboard, or click somewhere else in the Time Sheet window. To cancel the editing mode without saving changes done to the field, press Esc key on the keyboard. This behavior can be disabled in the Preferences. Edit - similar to double-clicking the time sheet field. This command puts the field it was invoked for into the editing mode. You can also invoke this command by pressing Enter on the keyboard. Cut - places the contents of the time sheet field under cursor onto the Clipboard and erases the field. You can also invoke this command by pressing Ctrl+X on the keyboard. Copy - places the contents of the time sheet field under cursor onto the Clipboard without changing the field. You can also invoke this command by pressing Ctrl+C on the keyboard. Paste - takes text from the Clipboard and places it into the time sheet field under cursor. Note that time sheet fields containing time must be formatted as local time for the Time Sheet program to accept it. You can also invoke this command by pressing Ctrl+V on the keyboard. Delete - Erases the time sheet field under cursor. Note that once erased the contents of the time sheet field cannot be reverted! You can also invoke this command by pressing Del on the keyboard. Duplicate Line - Duplicates a day line from in the time sheet. If the time sheet cursor was on an empty day line, this command takes a non-empty line from above. In case the time sheet cursor was on a non-empty day line, this command copies this line to the next empty line below, if one is available. You can also invoke this command by pressing Ctrl+D on the keyboard. This command does not copy the contents of the Itemized and Comments columns. Cut Line - places the contents of the entire time sheet day line under cursor onto the Clipboard and erases the whole line. You can also invoke this command by pressing Ctrl+Shift+X on the keyboard. Copy Line - places the contents of the entire time sheet day line under cursor onto the Clipboard without changing it. You can also invoke this command by pressing Ctrl+Shift+C on the keyboard. Paste Line - takes text from the Clipboard and places it into the entire time sheet day line under cursor. Note that time sheet fields containing time must be formatted as local time for the Time Sheet program to accept it. You can also invoke this command by pressing Ctrl+Shift+V on the keyboard. Delete Line - Erases the contents of the entire day line under cursor. Note that once erased the contents of the day line cannot be reverted! You can also invoke this command by pressing Ctrl+Shift+Del on the keyboard. Copy Entire Month - places the contents of the entire time sheet for the currently selected month onto the Clipboard as tabulated text. Print command - lets you finalize and print currently selected time sheet in a form of the Employee Time Record that can be submitted as a proof of work to receive employee's paycheck. This command is also available after pressing Ctrl+P shortcut on the keyboard, or by going to Reports -> Print Current Time Sheet in the main menu. When a time sheet record is finalized, users will no longer be able to modify it. This prevents inadvertent entering of work hours into time period that you were already paid for. Any user can finalize their own time sheet records before they print the time sheet. In case an employee allows other employees to view his or her time sheet, a different logged in employee will not be able to finalize their time records if the employee whose time sheet is displayed for viewing does not allow finalizing of time records by other employees. Note that such restriction does not apply to accountants and administrators. After time sheet records were finalized, an administrative user or an accountant can revert them back, or de-finalize them later. This window will not be displayed if "Show 'Finalize & Print' window when printing time sheet" setting is not enabled in the job settings, and the user invoking the print command is allowed to finalize selected employee's time sheet. In that case the Time Sheet program will automatically finalize and print employee's time sheet records with the parameters defined in the job settings. The title of the window will display the name of the job that the time sheet record(s) are printed for. In case of a multiple selection, it will display the number of time sheets and/or jobs & employees that time sheets are being printed for. In case there's more than one user currently selected, the control in the top-right corner will display "[Multi-selection]" instead of a specific date. Custom range - allows for a user to specify any arbitrary date range using From and To date controls. Pay days cannot point to the same day of the month. Period cannot be less than 1 or greater than 999 days. Entire range - pay period that includes the entire date range specified above. This option cannot be used if `Pay cycle for` option was selected in the Date Range section. Starts on a pay day - when selected will define pay cycle(s) as starting on selected pay day. Ends on a pay day - when selected will define pay cycle(s) as endng on selected pay day. 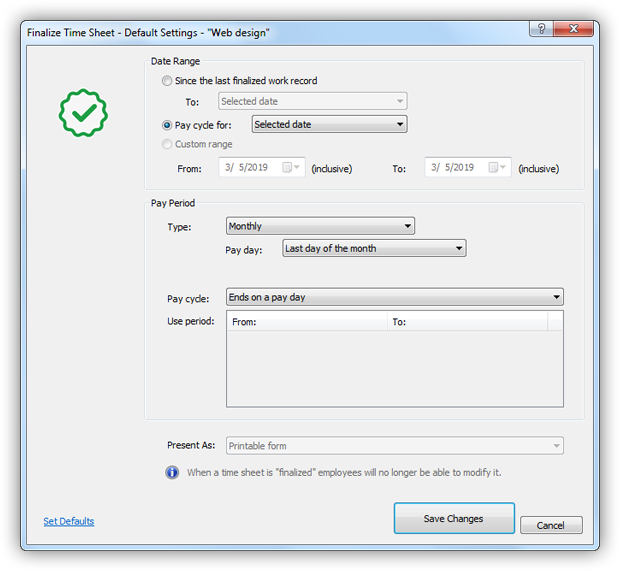 Use period list of available pay periods (cycles) to fit the date range selected above. The list allows for a user to check one or more pay periods to use. At least one period must be checked to finalize and print Employee Time Record(s). If this list is empty, this means that the selection in other controls did not yield any results. Change any of the controls in the window to update this list. You can right-click this list to see a context menu with additional commands that will allow you to check, uncheck and toggle pay periods in the list. This control is grayed out and unavailable when this window is accessed from the Job settings. Printable form - when selected will generate a printable document. This option is used by default. You can also select some other option to be used by default in the program's Preferences, in the Printing tab. Save as CSV file - when selected will allow you to save the report as the CSV file. User will be asked to provide the location and file name for the .csv file after report is generated. Open as CSV file (MS Excel) - when selected will save the report as the CSV file in a temporary location, and then attempt to open it with your default spreadsheet application, such as Microsoft Excel. Note that if Microsoft Excel is not available, or if it is not specified in Windows Control Panel as the default application for opening .csv files, some other spreadsheet application, or none, may be used instead. Print without finalizing - allows to generate Employee Time Record(s) report for selected parameters, without finalizing those time sheets. It uses the "Present As" control selection to determine how to generate the report. Finalize & Print button finalizes the time sheet(s) according to selection in this window and then geenrates Employee Time Record(s) for selected parameters. It uses the "Present As" control selection to determine how to generate the report. This button may be disabled if the employee, whose time sheet is being finalized by a different employee, does not allow finalizing of their records by other employees. Cancel - closes the window without finalizing or printing Employee Time Record(s). Reset To Defaults - resets controls in this window to their default values. This option will not be available in case of a multiple job selection. Printing is done via your web browser. You can specify additional details in Preferences. 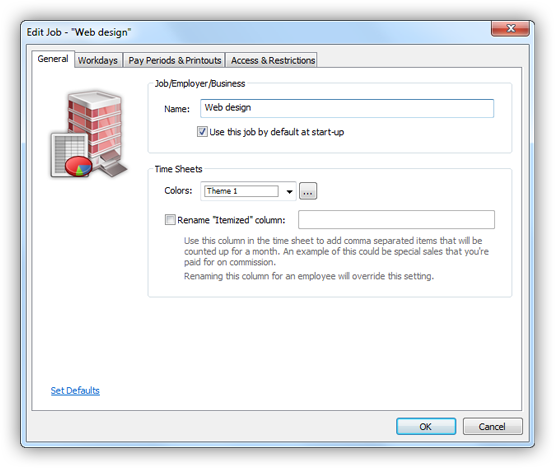 Time Sheet program can instruct your web browser to display the Print Dialog automatically, although you can disable this feature in the Preferences. You can also click Print link/icon on the page to print it manually. The font and spacing in the employee time record printout, as well as delineation between weeks can be customized in the Preferences. You can also set up via Preferences whether you'd like comments and date & time the form was printed to be included in the printout. 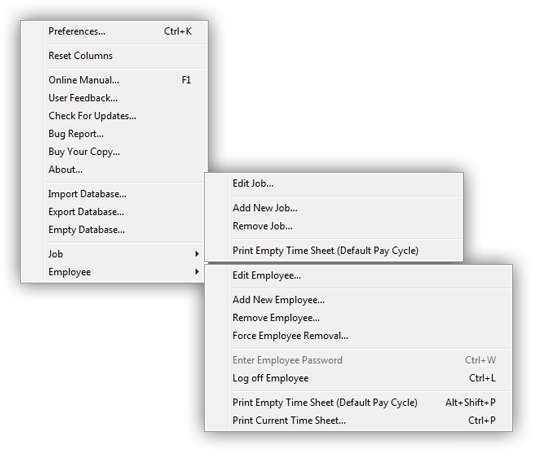 You can print an empty Time Record for the currently selected job & employee by pressing the Alt+Shift+P keyboard shortcut, or by going to Employees -> Print Empty Time Sheet in the main menu, or by going to Jobs -> Print Empty Time Sheet to print it only for selected job record. It is highly recommended to fix all inconsistencies before proceeding with printing of employee time record. In most cases an inconsistency would be caused by a missing time. Like in the example above, there's only one time specified for the workday on September 21, 2011. Adding a time in the "Time In" column will fix the issue. If you cancel printing at this stage work records in the time sheet will not be finalized. "?" button - displays the information about the Time Sheet program. Preferences - displays the Preferences window. You can also invoke this command by pressing Ctrl+K on the keyboard. Reset Columns - resets widths of each column in the Column Header of the time sheet controls to their defaults. Online Manual - displays the online version of this manual. You can also invoke this command by pressing F1 on the keyboard. User Feedback - takes you to our web site that will allow you to submit your feedback about the Time Sheet program for the developers of this software. Check For Updates - takes you to the page that will allow you to check for an update for the Time Sheet app. In case of the Windows Store version of the app this command will open Windows Update window that should allow you to see if an update to the Time Sheet app is available. Bug Report - takes you to our web site that will allow you to submit a report about any bugs encountered while running the Time Sheet program. Buy Your Copy - (displayed in a trial, or demo copy only) allows you to purchase the license for the number of copies of the Time Sheet software. For the desktop version of the app, all payments are made via a secure connection through PayPal. Note that your personal and payment information, such as credit card or check/bank number, will be used only at PayPal, and will not be shared with us. This ensures a secure transaction for our customers. For the Windows Store version of the app, all payments will be processed by the Windows 10 Store app. About - displays the About window. Import Database - displays the Import Database window that allows you to import data from another copy of the Time Sheet program. Export Database - displays the Export Database window that allows you to export data to be added to another copy of the Time Sheet program. Empty Database - displays the window that allows to initialize the Time Sheet program database to its original (or empty) state. Edit Job - displays a window that allows to edit the currently selected job record. Add New Job - displays a window that allows to add a new job record. Remove Job - displays a window that allows to remove a currently selected job record. Print Empty Time Sheet (Default Pay Cycle) - allows to print an empty "Employee Time Record" form for a currently selected job for the default pay period that is defined in the job settings. Edit Employee - displays a window that allows to edit a currently selected employee account. 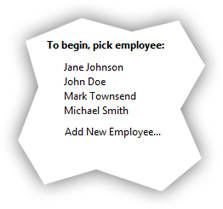 Add New Employee - displays a window that allows to add a new employee account. Remove Employee - displays a window that allows to remove a currently selected employee account. Force Employee Removal - displays a window that allows to schedule a removal of a currently selected employee account. You would normally use this option to remove an employee account of an employee that is no longer present to do it himself/herself. This option is provided for compatibility with older versions of the Time Sheet program. In the latest version of the app, create and use an administrative account to remove other employee accounts. Enter Employee Password - switches keyboard focus to Password controls in the Time Sheet program window. You can also invoke this command by pressing Ctrl+W on the keyboard. Log off Employee - Makes the Time Sheet program forget an employee password, if one was entered earlier, and switches the main window to the welcome screen. You can also invoke this command by pressing Ctrl+L on the keyboard. Print Empty Time Sheet (Default Pay Cycle) - allows to print an empty "Employee Time Record" form for currently selected job, and for currently selected employee, using the default pay period that is defined in the job settings. You can also invoke this command by pressing Alt+Shift+P on the keyboard. Print Current Time Sheet - lets you finalize & print currently selected time sheet in the form of "Employee Time Record". This command is similar to clicking the Print button. You can also invoke this command by pressing Ctrl+P on the keyboard. Name of the currently logged in user/employee. This section may also include the type of the user account, in parantheses: Administrator, Accounting, as well as whether or not an employee is part-time. Note that the name of the currently logged in user may be different than the name of the currently selected employee. This may occur if an administator or an accountant switches to a different employee's time sheet after they themselves logged in to the Time Sheet program. In that case the name of the currently logged in user will be displayed in the status bar, while the name of the currently selected employee will be displayed in the top part of the Time Sheet program window. Read here for more details. Name of the currently selected job record. Current value of the total work hours for the selected employee, for the selected month, for the selected job. Current value of the total overtime hours for the selected employee, for the selected month, for the selected job. For description of how the overtime hours are calculated by the Time Sheet program read the settings defining workday length for a job record. Length of the workday (in hours) for the day line under the time sheet cursor. CAPS indicates that the Caps Lock is on. NUM indicates the the Nums Lock is on. Back up Database - backs up the current database into a folder that was defined in Preferences. This command is also available via Ctrl+Shift+B keyboard shortcut. Note that the Time Sheet program can be configured to do automatic backups right before the app is closed. Restore From Backup - opens the Import Database window that allows to restore from a previous backup. This command requires an administrative user login. Such login will be omitted if there's no administrative users currently present in the Time Sheet program database. Use any of the importing options available to restore previous database. Log Off - logs off currently logged in employee and closes their time sheet. This command is also available via Ctrl+L keyboard shortcut. Import Database - opens the Import Database window that allows to import from a previously backed up or exported database. 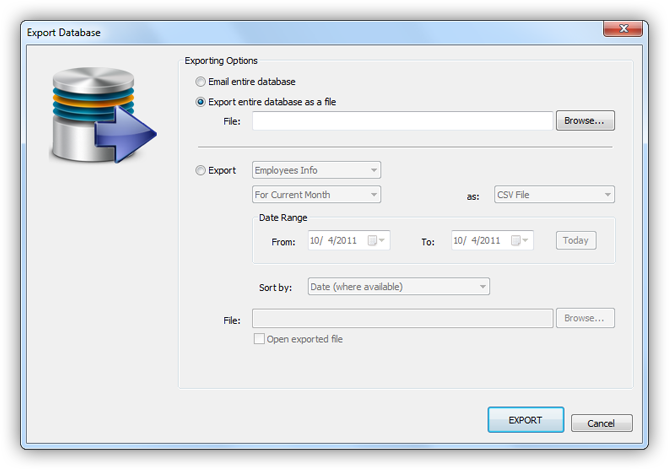 Export Database - opens the Export Database window that allows to export current database. Empty Database - opens the Import Database window that allows to reset the current database to its original (empty) state. Use "Import a blank database" option to empty the database. Exit - closes the Time Sheet program. This command is also available via Alt+F4 keyboard shortcut. Edit Cell - initiates editing of the time sheet field under cursor. This command is also available via Enter keyboard shortcut. Cut - cuts the contents of the time sheet field under cursor onto the Clipboard. This command is also available via Ctrl+X keyboard shortcut. Copy - copies the contents of the time sheet field under cursor onto the Clipboard. This command is also available via Ctrl+C keyboard shortcut. Paste - pastes contents of the Clipboard into the time sheet field under cursor. This command is also available via Ctrl+V keyboard shortcut. Delete - deletes the contents of the time sheet field under cursor. This command is also available via Del keyboard shortcut. Duplicate Line - duplicates line under cursor into another line in the time sheet. This command is also available via Ctrl+D keyboard shortcut. Cut Line - cuts line under time sheet cursor onto the Clipboard. This command is also available via Ctrl+Shift+X keyboard shortcut. Copy Line - copies line under time sheet cursor onto the Clipboard. This command is also available via Ctrl+Shift+C keyboard shortcut. Paste Line - pastes contents of the Clipboard into the time sheet line under cursor. This command is also available via Ctrl+Shift+V keyboard shortcut. Delete Line - deletes line under time sheet cursor. This command is also available via Ctrl+Shift+Del keyboard shortcut. 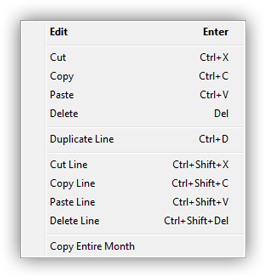 Copy Entire Month - copies contents of the time sheet under cursor for the entire month onto the Clipboard. Preferences - shows the Preferences window that allows to change (local) Time Sheet program settings. Today - makes the Time Sheet program switch focus to today's record. This command is also available via Ctrl+T keyboard shortcut. Next Month - advances the time sheet focus to the next month. This command is also available via Ctrl+Right Arrow keyboard shortcut. Previous Month - advances the time sheet focus to the previous month. This command is also available via Ctrl+Left Arrow keyboard shortcut. Next Year - advances the time sheet focus to the next year. This command is also available via Ctrl+Shift+Right Arrow keyboard shortcut. Previous Year - advances the time sheet focus to the previous year. This command is also available via Ctrl+Shift+Left Arrow keyboard shortcut. First Time Sheet Record - advances the time sheet focus to the first available time sheet record for the employee. Last Time Sheet Record - advances the time sheet focus to the last available time sheet record for the employee. Specific Date - advances the time sheet focus to an arbitrary date. After this command is invoked, the Time Sheet program will display a date picker window that will allow for a user to pick desired date. This command is also available via Ctrl+G keyboard shortcut. Edit Job - displays a window that allows to edit currently selected job settings. Add New Job - displays a window that allows to add new job record. Remove Job - displays a window that allows to remove currently selected job record. Default Pay Period - prints a time sheet record using default pay period specified for the job. To view or change the default pay period for the job go to Jobs -> Edit Job from the main menu, then click "Set up default pay period & finalize parameters for printing time sheets" and specify the desired pay period. Make sure to save changes. Monthly Pay Period - prints a time sheet record using monthly pay period. This feature uses printing parameters specified in the job settings. Semi-Monthly Pay Period - prints a time sheet record using semi-monthly pay period. Bi-Weekly Pay Period - prints a time sheet record using bi-weekly pay period. Weekly Pay Period - prints a time sheet record using weekly pay period. Edit Employee - displays a window that allows to edit currently selected employee account. Add New Employee - displays a window that allows to add new employee account. Remove Employee - displays a window that allows to remove currently selected employee account. Force Employee Removal - displays a window that allows to schedule forced removal of an employee account if that employee's password is not available. Enter Employee Password - switches keyboard focus to the password field, thus allowing a user to enter employee's password, needed to switch the time sheet record into the write mode. This command is also available via Ctrl+W keyboard shortcut. Log Off Employee - logs off currently logged in employee and closes their time sheet. This command is also available via Alt+Shift+P keyboard shortcut. 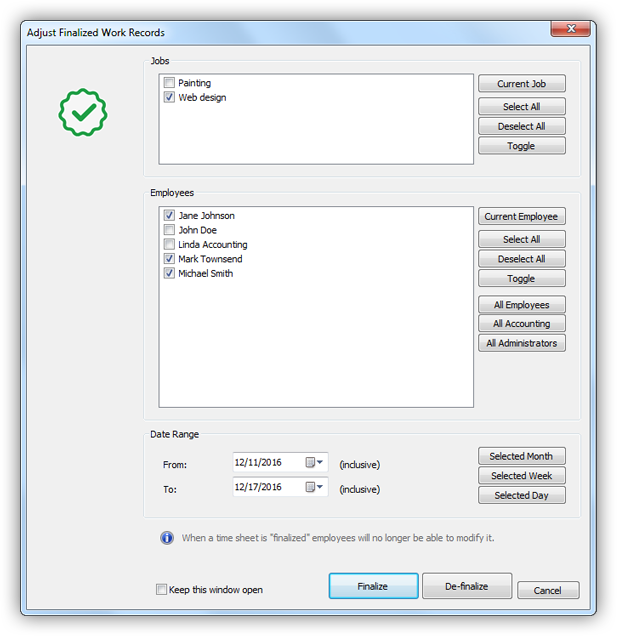 Adjust Finalized Work Records - displays a window that allows to adjust previously finalized work records, as well as to add new finalization. This command requires an accountant or an administrative user login. Such login will be omitted if there's no administrative users currently present in the Time Sheet program database. Purge Database - displays a window that allows to manually remove old time sheet records. Note that a user login is required to purge that user's records from a database. If user does not have a password, leave the password field blank. Print Current Time Sheet - lets you finalize and print the currently selected time sheet in a form of the Employee Time Record. This command is also available via Ctrl+P keyboard shortcut, or via Ctrl+Shift+P if you want to display the "Finalize & Print" window unconditionally. 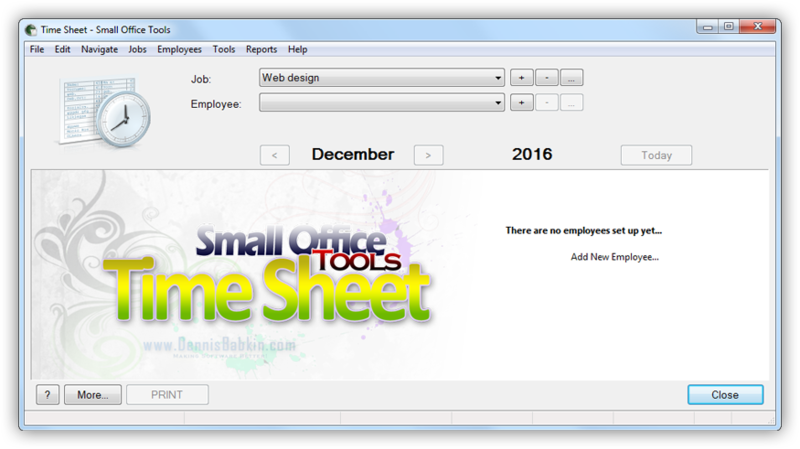 Print Time Sheets - displays a window that allows to finalize and print Employee Time Records for multiple jobs and employees at once. Work Hours Report - displays a window that allows to view and print work hours reports for multiple jobs and employees at once without printing their time sheet records. Online Manual - opens a web browser and navigates to the online help page for the Time Sheet program. This command is also available via F1 keyboard shortcut. Internet connection is required for this command to work. Online Video Tutorial - opens a web browser and navigates to the online page with the video tutorial on how to use the Time Sheet program. The video screencast was recorded for an earlier version of the Time Sheet program that may not have all newer features described in this document. Frequently Asked Questions - opens a web browser and navigates to the online page with Frequently Asked Questions about the Time Sheet program. It is recommended that you check this page first before submitting a question to our support team via user feedback. Buy Your Copy - use this command to buy a license for your number of copies of the Time Sheet program. This command is present only in the trial (or demo) copy of the program. We spend our best efforts developing the Time Sheet program, and we appreciate your support by buying your copy! 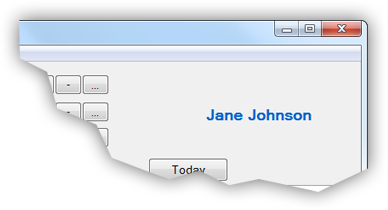 Authorize Your Copy - (displayed in a desktop trial copy only) opens up a window that allows you to authorize (or register) your copy of the Time Sheet software. To do so you will need your individual registration name and code, which will be emailed to your PayPal address after you make a one-time purchase of the Time Sheet license. Registration name and code are issued per Windows user account and cannot be shared. Re-using the registration name and code on the number of Windows user accounts that exceed the license term may invalidate your license! When moving the Time Sheet software to a new location, please make sure to de-authorize it. If you did not receive the registration email please make sure to check your Spam, Junk or Other folders. Many email providers place registration emails in those locations. In case you still can't find the registration email, read FAQ 20 that will explain how you can contact us. This option is not available if you downloaded the Time Sheet program from the Windows 10 Store. De-Authorize - use this command to remove registration for this copy of the Time Sheet program before moving it to another computer. This command is present only in the registered Desktop version of the program. Windows Store versions of the app cannot be de-authorized. User Feedback - opens a web browser and navigates to our user feedback page where you can send your comments to the developers of the Time Sheet program. Please make sure to check the Frequently Asked Questions page first before submitting your feedback. Check For Updates - opens a window where you can check if an update is available for your version of the Time Sheet program. If update is available, the page will give you more information about it and the instructions to install it. Bug Report - opens a web browser and navigates to our bug report page where you can send your bug reports to the developers of the Time Sheet program. Please make sure to check the Frequently Asked Questions page first before submitting your report. Suggest An Improvement - in case you feel that you have a good suggestion for improvement of the Time Sheet program, use this command to open a web browser and navigate to our feedback page that will allow you to send your suggestion to the developers of the Time Sheet program. About - displays the window with information about your copy of the Time Sheet program. Use this job by default at start-up - when checked, will ensure that this job is selected when the Time Sheet program is starting up. Only one job can be set as a default one. If no job is set as a default one, and this option is enabled, the Time Sheet program will load the job that was used last. The color theme will not be used during printing of the Employee Time Record. Drop-down list with preset color themes - lets you pick a predefined color theme. Your currently selected color theme will be selected by default. If your current color theme was customized, the list will contain an additional item, called "Custom". 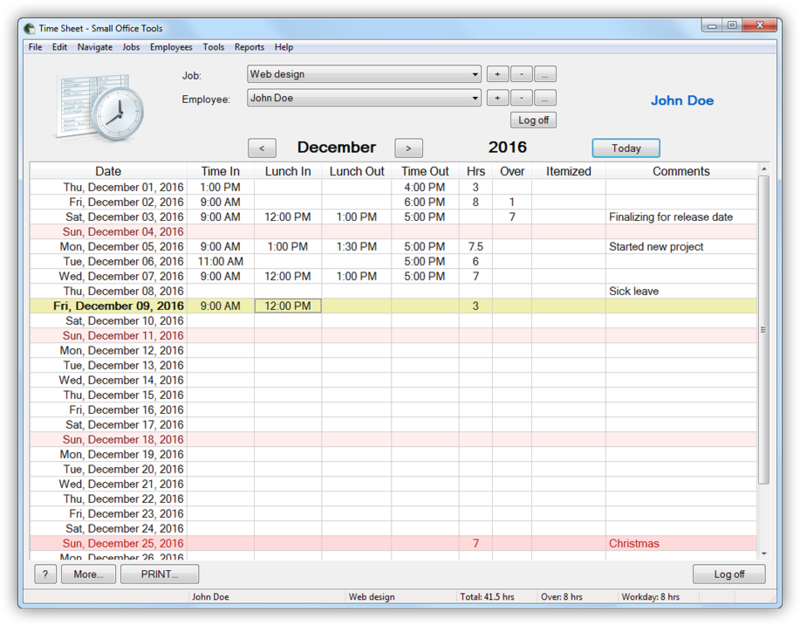 When creating a new job the Time Sheet program will automatically switch to the next color theme. Weekdays section - allow to set the background and text colors to be used for day lines that fall on weekdays in the time sheet controls. To change any of these colors, either click on the color swatch, or click the "..." button to the right. This will show a color picker dialog that will enable you to select color visually. Mondays, Tuesdays, Wednesdays, Thursdays, Fridays and Saturdays are treated as weekdays, if those don't fall on a holiday. 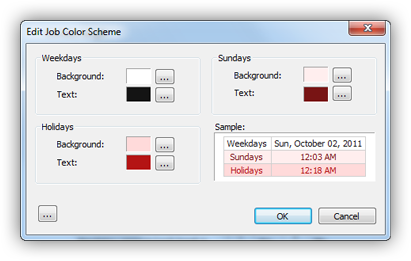 Sundays section - allow to set the background and text colors to be used for day lines that fall on Sundays in the time sheet controls. To change any of these colors, either click on the color swatch, or click the "..." button to the right. This will show a color picker dialog that will enable you to select color visually. Holidays section - allow to set the background and text colors to be used for day lines that fall on holidays in the time sheet controls. To change any of these colors, either click on the color swatch, or click the "..." button to the right. This will show a color picker dialog that will enable you to select color visually. 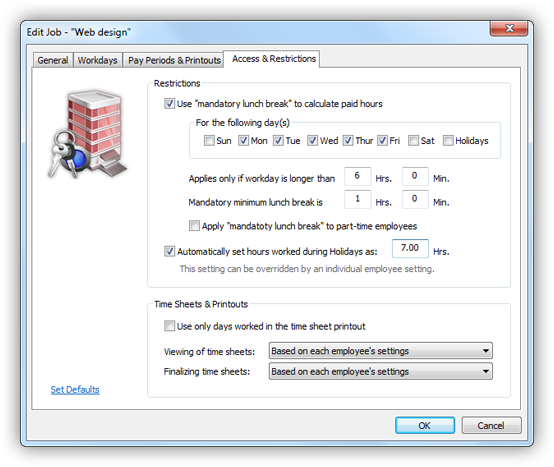 You can define holidays to be used by the Time Sheet program in the Preferences. Sample window - displays an approximation of how the time sheet controls will look with the current customization of the color theme. Copy Color Scheme - copies colors for controls displayed in the window on to the Windows Clipboard. Paste Color Scheme - pastes colors from the Windows Clipboard into controls in the window. Reset Color Scheme - resets controls in the window to the colors that they contained when the window was first opened (and before any modifications were applied.). Set to Default Color Scheme - resets controls in the window to the colors of the default color scheme for the job. Default color scheme is defined when a job record is created. The Time Sheet program by default attempts to apply different color schemes for different jobs. This is intended to provide a visual aid for the users to distinguish between different job records. OK button - click it to accept changes to the color theme and close the window. Cancel button - click it to discard changes to the color theme and close the window. Rename "Itemized" column - check this box, and specify any name to be used for the "Itemized" column in the time sheet controls, as well as in the Employee Time Record printout. If this option is off, the Time Sheet program will use the name "Itemized". You can also keep the "Itemized" column blank by not giving it any name. This option can be further refined in the employee settings. For details check the description for the Itemized column. A text on the right displays currently selected length of the workday in hours. The Time Sheet program considers Mondays, Tuesdays, Wednesdays, Thursdays and Fridays as weekdays if those don't fall on a holiday. 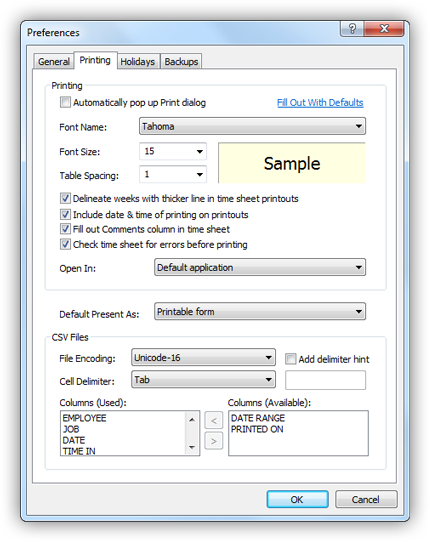 Show 'Finalize & Print' window when printing time sheets - when checked will show the Finalize & Print window before printing time sheet records for the job. (Such window allows selection of pay periods and finalization options.) If unchecked, the default pay period and finalize parameters will be used instead. 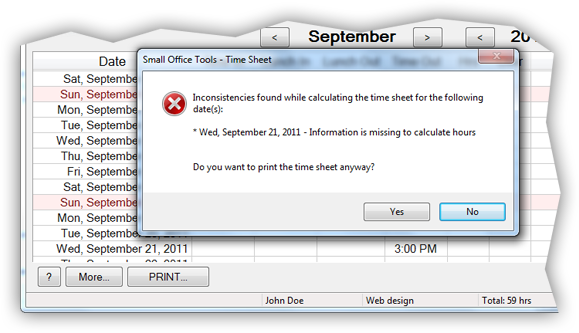 In this case, no popup window will be displayed when printing time sheet records. When this option is unchecked, a user can still bring up the Finalize & Print window by holding down the Shift keyboard key while invoking the command to print the time sheet. These settings will be used as job's default time sheet printing settings if 'Show Finalize & Print window when printing time sheet' option is turned off. Most controls in this window are analogous to the ones described for the Finalize & Print window, with exception of custom dates, and Present As drop-down box, that cannot be used for default parameters. Set Defaults - will reset all controls in this window to their pre-configured defaults. Save Changes - click this button to apply changes done in this window. Note that settings in this window will be saved into the job settings only when the job settings window itself is closed with OK or Add buttons. Cancel - click this button to discard all changes. Use mandatory lunch break to calculate paid hours - check this box to enable the Time Sheet program to enforce a mandatory lunch break on employees submitting their work hours for this job. A mandatory lunch break is defined by the Time Sheet program as the amount of time each employee must submit as an unpaid lunch break, provided their workday was longer than a specific number of hours. If mandatory lunch break was applied to an employee's work hours, an asterisk will be placed next to it in the time sheet record with the short explanation of the deduction. For the following day(s) - these checkboxes allow to specify days of the week, as well as holidays in general, when applying mandatory lunch break condition is required for the job. Applies only if workday is longer than - allows to specify as hours and minutes the minimum length of an employee's workday for the mandatory lunch break to be applied. To further illustrate this concept, imagine that the mandatory lunch break was set to 1 hour, and the minimum required workday length for it to be applied was set at 6 hours. An employee submitting a work time from 8 am to 1 pm (without a lunch break) would have worked for 5 hours. In this case, since 5 hour work day is less than 6 hours, the mandatory lunch break will not be applied for that day. Mandatory minimum lunch break is - allows to specify as hours and minutes the length of the mandatory lunch break for this job. Note that the mandatory lunch break is treated by the Time Sheet program as an unpaid lunch break imposed on employees submitting their work hours for the job according to the following rule: If an employee's work time (excluding a reported lunch break) is more or equal to the amount of time specified in the "Applies only if workdays longer than" setting, the Time Sheet program will automatically deduct the number of hours specified in the "Mandatory minimum lunch break" setting as a mandatory lunch break. The exception to this rule is if an employee is a part-time employee, and "Apply mandatory lunch break to part-time employees" setting is not checked. The mandatory lunch break is not deducted if an employee reports a lunch break longer or equal to the length of the mandatory lunch break. Apply "mandatory lunch break" to part-time employees - if not checked, and a part-time employee's work time qualifies for the mandatory lunch break conditions described above, such employee will be excluded from them. If checked, all part-time employees will be treated as regular employees when calculating their work hours for the job. You can specify whether or not an employee is part-time in the settings by going to Employees -> Edit Employee from the main menu. Automatically set hours worked during Holidays as - check this box to enable the Time Sheet program to automatically set the number of regular work hours during defined holidays for each employee of this job to the number of hours specified by this control. Or, in other words, set this option to grant a paid number of work hours during holidays for the employees of this job. 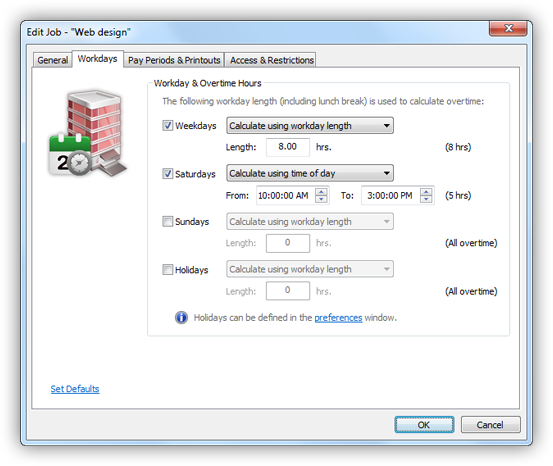 In case an employee manually specifies work hours during a holiday it will override this automatic setting. You can specify whether or not each individual employee should be entitled to receive automatic holiday paid hours in the employee settings. The number of holiday hours can be specified in the text field as a decimal value. This value must be a positive number or 0. If zero is specified the Time Sheet program will include holidays in the Employee Time Records but it will not assign any holiday hours to the employees. Use only days worked in the time sheet printout - check this box to make the Time Sheet program strip out all empty lines from the Employee Time Record printout, or days when an employee didn't work. This setting does not affect viewing of accountants and administrative users. Enforce all to allow viewing by other employees - when selected, this option will override each employee account's individual setting and will enforce all employees for the job to allow viewing of their time sheet records by other employees. Note that modification of the employee's time sheet records is not affected by this setting. Or, in other words, other employees will not be able to change that employee's time sheet. Enforce all to disallow viewing by other employees - when selected, this option will override each employee account's individual setting and will enforce all employees for the job to disallow viewing of their time sheet records by other employees. This setting does not affect employees that do not have user account password. Note that this setting applies only if an employee allows viewing of their time sheets by other employees. This setting does not affect finalizing done by accountants or administrative users. Enforce all to allow finalizing by other employees - when selected, this option will override each employee account's individual setting and will enforce all employees for the job to allow finalizing of their time sheet records to be done by other employees that are allowed to view the time sheet. Note that employees will still be required to have a viewing access to be able to finalize other employee's time sheets. Enforce all to disallow finalizing by other employees- when selected, this option will override each employee account's individual setting and will enforce all employees for the job to not allow finalizing of their time sheet records to be done by other employees even if those employees are allowed to view the time sheet. Note that each employee will still be able to finalize their own time sheet. OK button - (in case of editing a job) accepts changes to the job record and closes the window. Note that changes may be rejected in case of an error. In that case you will see a pop-up message with an error description and the window will remain open. Note that an administrative user login is required to change a job record. Such login will be omitted if there's no administrative users currently present in the Time Sheet program database. ADD button - (in case of adding a new job) adds a new job and closes the window. Note that a new job record may be rejected in case of an error. In that case you will see a pop-up message with an error description and the window will remain open. Cancel button - discards any changes and closes the window. To continue with removal make sure to type the word remove into the text field and click the "Remove" button to finish job record removal. WARNING: Job record removal will be done as soon as you click the "Remove" button, without any further prompts! WARNING: Job record removal is permanent and cannot be undone later! WARNING: Removing a job record will also permanently remove employee time sheet records associated with it! INFO: You cannot remove last job record. If there's no administrator account set up, and if at least one of the employees associated with a job record being removed has their records protected by a password, such password will be required to complete the removal of a job record. In case such password cannot be provided, neither a job record, nor any employee's time sheet records associated with it will be removed. If there's no administrator account set up, to remove a job record containing time sheet records for employees that are no longer available use the "Force Employee Account Removal" option to remove those employee accounts first. Note that an administrative user login is required to add a new employee account. Such login will be omitted if there's no administrative users currently present in the Time Sheet program database. Employee - regular employee account that does not allow viewing or changing of other accounts. Accounting - Payroll user account that can view other employee accounts but cannot change their settings. Administrator - Special user account that can view and change other non-administrative accounts, as well as to perform administrative tasks within the Time Sheet program. Desktop Version: Administrative account will be required to uninstall the Time Sheet program. IMPORTANT: If the Time Sheet program does not have any administative user accounts, most administrative actions within the program will be available for all users. It is highly recommended to create at least one administrator account for security reasons. Part-time employee - if checked, will create a part-time employee account. A part-time employee account may be set up not to be affected by the mandatory lunch break condition in the job settings. Automatically apply holiday hours - if checked, will allow to automatically apply holiday paid hours to the work hours of this employee. This feature also requires that the job settings had configured and allowed to apply holiday hours. First Name - allows to specify the first name of employee. At least a first or a last name of employee is required to create a new employee account. An employee name cannot match an already existing name. Last Name - allows to specify the last name of employee. Password - allows to specify a password for a new employee. The Time Sheet program treats passwords as case-sensitive. The password field is intended to be filled out by an employee himself/herself. If password was used for an employee account, it will be required to change, or remove any time sheet records entered by that employee. When used by an accountant or an administrator, the password will serve the purpose of a login as well. Make sure that an employee remembers their password. If forgotten, request an administrator to change employee's password. If administrator account is not set up in the Time Sheet program, or if an administrator's account password needs to be reset, to delete such user account use "Force Employee Account Removal" option. WARNING: Make sure to memorize at least one administrator account password. Such password will be required to perform administrative tasks in the Time Sheet program, as well as to uninstall the desktop version of the program. If you forget all administrator accounts passwords there will be NO WAY to reset them! SECURITY NOTE: Employee passwords are not stored in an open form anywhere in the Time Sheet program database. The password hashing algorithm is used instead. This provides more secure measures of password storage, as well as guards against possible password leaks. Allow other employees to view this user's time sheet - if unchecked, and an employee account has a password, that password will be required to view employee's time sheet. If checked, or if an employee account does not have a password, anyone will be able to view that employee's time sheet. 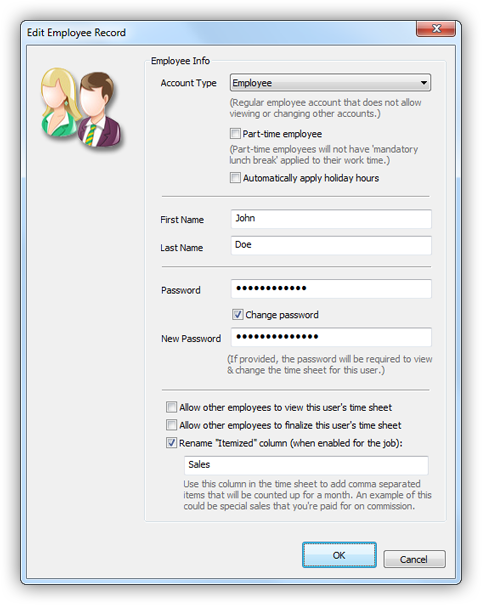 Note that if an employee account has a password and this option is enabled, that employee's time sheet will be available for viewing to everyone in a read-only mode. To be able to edit or change the time sheet, employee's password will be required. This option can be overridden by "Viewing of time sheets" job setting. This option is not available for accountants and administrators. For their account types a login is always required. Allow other employees to finalize this user's time sheet - if checked, and an employee setting allows other employees to view this employee's time sheet, this setting will also allow other employees to finalize this employee's time sheet when printing it. This option can be overridden by "Finalizing time sheets" job setting. This option is not available for accountants and administrators. Rename "Itemized" column (when enabled for the job) - if checked, will provide an option to rename "Itemized" column in the time sheet specifically for this employee. You can type a short name for the "Itemized" column in the text box below. To be able to use this option, the same named option must be enabled in the job settings. For details check the description for the Itemized column. ADD button - adds this employee account to the set of employees used by the Time Sheet program. Note that a new employee account may be rejected in case of an error. In that case you will see a pop-up message with an error description and the window will remain open. 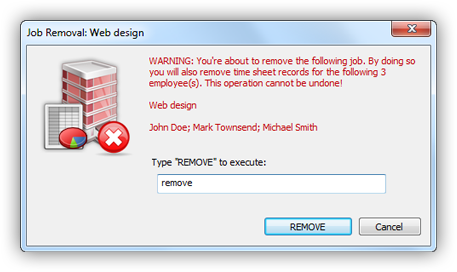 Cancel button - discards any changes done in this window and closes it without adding a new employee. Note that an administrative user login is required to remove a employee account. Such login will be omitted if there's no administrative users currently present in the Time Sheet program database. 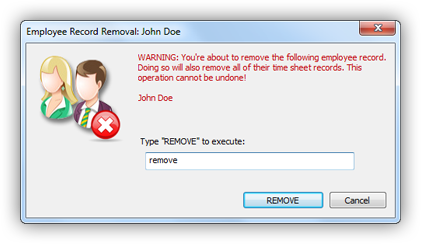 To continue with removal make sure to type the word remove into the text field and click the "Remove" button to finish employee account removal. WARNING: Employee account removal will be done as soon as you click the "Remove" button without any further prompts! WARNING: Employee account removal is permanent and cannot be undone later! If an employees account is protected by a password, such password will be required to complete the removal of an employee account. Request an administrator to remove an employee account that is no longer available. If there's no administrator set up in the Time Sheet program, or if the account that is needed to be removed is an administrator, use the "Force Employee Account Removal" option. An account type can be changed to an employee or an accountant only by an administrator. Changing an account type to administrator is not allowed. Part-time employee - if checked, will signify this as a part-time employee account. A part-time employee account may be set up not to be affected by the mandatory lunch hour break condition in the job settings. At least a first or a last name of employee is required. Password - fill in user password to apply changes to an employee account in this window. The Time Sheet program treats passwords as case-sensitive. Password is not required for an administrator making changes to that employee's account. Change Password - set this checkbox to change this employee account password. New Password - allows to provide a new password for the employee account. The Time Sheet program treats passwords as case-sensitive. To be able to use this field make sure to check "Change password" checkbox above. OK button - saves changes done to an employee account and closes this window. Note that changes to an employee account may be rejected in case of an error. In that case you will see a pop-up message with an error description and the window will remain open. Cancel button - discards any changes done in this window and closes it. Note that an administrative user login is required for the forced employee account removal. Such login will be omitted if there's no administrative users currently present in the Time Sheet program database. Employee drop-down list - lets you pick the employee account to set forced removal for. Note that if there's at least one administrator account present in the Time Sheet program, this list will include only administrator accounts. Other employee accounts can be removed by a logged in administrator without forced/delayed removal option. Schedule Removal button - lets you schedule a "delayed" employee account removal after N days from the current date. (N will be set at 30 days for employees, and at 90 days for accountants and administrators.) Note that this option does not automatically remove an employee account after that period. It simply allows you to manually remove that employee account after expiration of the waiting period. This limitation is imposed intentionally to prevent unintended or malicious removal of password protected employee accounts. After expiration of the waiting period an employee account can be removed using the regular employee removal process. In that case an employee's password will not be required for removal. 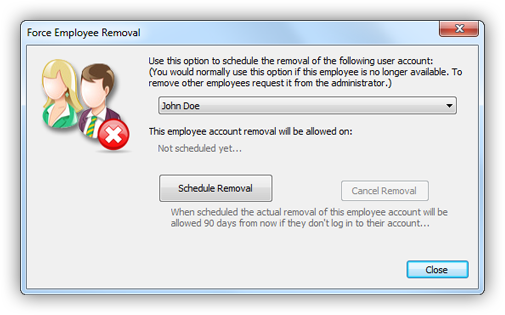 Cancel Removal button - cancels the "delayed" employee account removal. Once cancelled, the 30- or 90-day waiting period required for "delayed" removal will be reinstated if it is later scheduled again. LEGAL WARNING: Unauthorized tempering with individual's private information may be illegal in your country/state/jurisdiction. Jobs list - contains list of available job records. Check those that you would want to finalize or de-finalize work records for. At least one job must be checked in the list. Current Job button puts a check mark on the currently selected job in the list. Select All button puts check marks on all jobs in the list. Deselect All button removes check marks from all jobs in the list. Toggle button toggles checkboxes on all jobs in the list. Employees list - contains list of available employee accounts. Check those that you would want to finalize or de-finalize work records for. At least one employee account must be checked in the list. Current Employee button puts a check mark on the currently selected employee account in the list. Select All button puts check marks on all employee accounts in the list. Deselect All button removes check marks from all employee accounts in the list. Toggle button toggles checkboxes on all employee accounts in the list. All Employees button puts check marks only on employee accounts in the list, while not affecting other accounts. All Accounting button puts check marks only on accountants in the list, while not affecting other accounts. All Administrators button puts check marks only on administrators in the list, while not affecting other accounts. From control allows to pick date to finalize or de-finalize work records from. Finalization or de-finalization will begin from the midnight hour of selected day. To control allows to pick date to finalize or de-finalize work records to. Finalization or de-finalization will end on the last hour of selected day. Selected Month button picks the date range to include the entire month to match currently selected date. Finalization or de-finalization will begin from the midnight hour & will end on the last hour of selected month. Selected Week button picks the date range to include the entire week to match currently selected date. Finalization or de-finalization will begin from the midnight hour & will end on the last hour of selected week. Selected Day button picks the date range to include currently selected date. Finalization or de-finalization will begin from the midnight hour & will end on the last hour of selected day. Keep this window open - if checked, will keep "Adjust Finalized Work Records" window open after finalization or de-finalization of the work records is complete. If unchecked, the window will automatically close. Finalize button begins finalizing the work records according to selected criteria in this window. Read here for details about finalizing employee's work records. Note that the user invoking this command must be allowed to finalize selected employee's time records for selected job(s). Note that finalization may be rejected in case of an error in the input parameters. In that case you will see a pop-up message with an error description and the window will remain open. De-finalize button begins removing finalization (or de-finalizing) the work records according to selected criteria in this window. Note that de-finalization may be rejected in case of an error in the input parameters. In that case you will see a pop-up message with an error description and the window will remain open. Cancel button closes this window without applying any changes. Note that a user login is required to print the time sheet records. If user does not have a password, leave the password field blank. By logging in as an accountant or an administrator you will be able to access multiple employee accounts at once. Jobs list - contains list of available job records. Check those that you would want to finalize & print time sheets for. Employees list - contains list of available employee accounts. Check those that you would want to finalize & print time sheets for. By job & employee - will sort & group all Employee Time Records by jobs and then by employees. By employee & job - will sort & group all Employee Time Records by employees and then by jobs. Use only days worked in the time sheet printouts - a triple state checkbox. Wheck checked, will include only filled in (or non-blank) work days in all Employee Time Record printouts. When unchecked, will include the entire pay period (that may include blank days) in all Employee Time Record printouts. When in the intermediate state, will use the "Use only days worked in the time sheet printout" setting from each job record involved in printing. Check time sheet for errors & inconsistencies - a triple state checkbox. When checked, will check each time sheet for possible errors and inconsistencies before printing. When unchecked, will not perform errors and inconsistency checks before printing time sheets. When in the intermediate state, will use the "Check time sheet for errors before printing" setting from Preferences to determine whether or not to check each time sheet for possible errors and inconsistencies before printing. Read here for details on checking time sheets for errors and inconsistencies. In case any of the time sheets involved in the printout do not pass the errors and inconsistency checks, the Time Sheet program will display an error message. If user then chooses to cancel printing, selected work records in time sheets will not be finalized. Skip empty time sheets - when checked, will skip printing Employee Time Records if they have no filled in work hours, or are entirely blank for the pay period. When unchecked, will print every Employee Time Record, even if it is empty. Keep this window open after printing - if checked, will keep "Print Time Sheets" window open after all time sheets are finalized & printed. If unchecked, the window will close automatically. 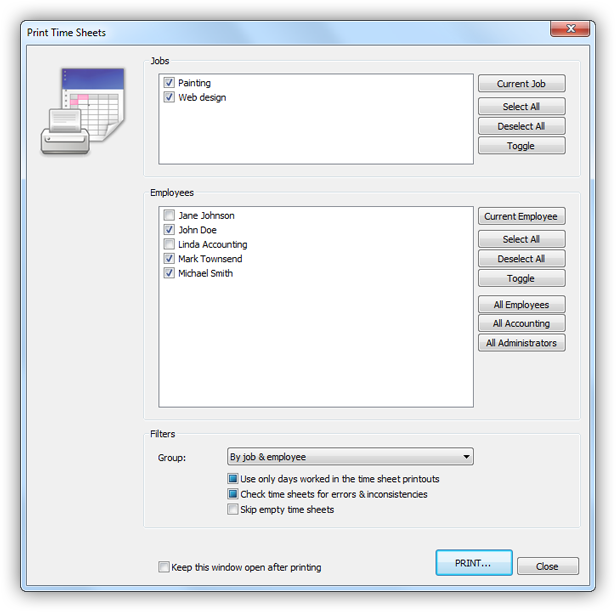 Print button will show "Finalize & Print Time Sheet" window that will allow to specify finalization & printing options for selected time sheets, as well as to begin the printing process. Note that printing may be rejected in case of an error in the input parameters. In that case you will see a pop-up message with an error description and the window will remain open. Close button closes this window without applying any changes. Note that a user login is required to generate employees work hours report. If user does not have a password, leave the password field blank. Jobs list - contains list of available job records. Check those that you would want to print work hours report for. Employees list - contains list of available employee accounts. Check those that you would want to print work hours report for. By job - will group results by job records. By employee - will group results by employee accounts. This week - picks the date range to include the current week. This month - picks the date range to include the current month. This year - picks the date range to include the current year. Last week - picks the date range to include the week prior to the current week. Last month - picks the date range to include the month prior to the current month. Last year - picks the date range to include the year prior to the current year. Specific month - picks the date range to include a specific calendar month for the current year. Currently selected month & year - picks the date range for the month to match currently selected date. Specific date range - enables From and To controls that allow for a user to specify two arbitrary dates for the date range. Both dates will be used inclusively in the date range. Check time sheets for errors & inconsistencies - a triple state checkbox. When checked, will check each time sheet for possible errors and inconsistencies before printing the report. When unchecked, will not perform errors and inconsistency checks on time sheets. When in the intermediate state, will use the "Check time sheet for errors before printing" setting from Preferences to determine whether or not to check each time sheet for possible errors and inconsistencies before printing the report. In case any of the time sheets involved in the printout do not pass the errors and inconsistency checks, the Time Sheet program will display an error message. 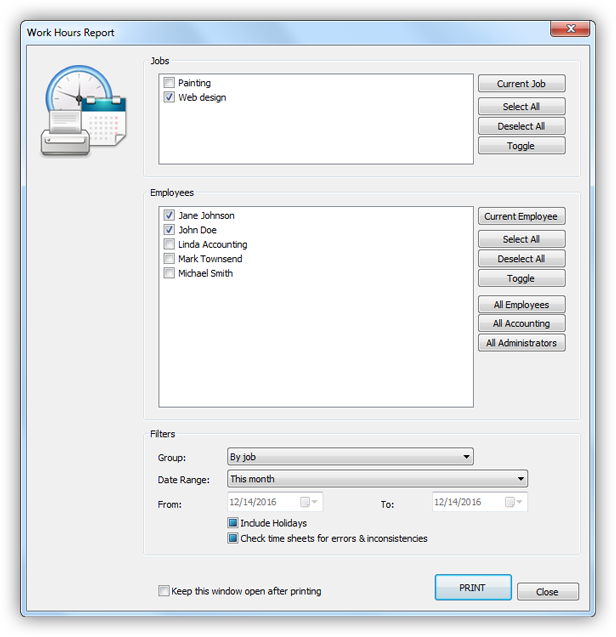 Keep this window open after printing - if checked, will keep "Work Hours Report" window open after report is printed. If unchecked, the window will close automatically. Note that an administrative user login is required to import a database. Such login will be omitted if there's no administrative users currently present in the Time Sheet program database. The most useful application of the importing/exporting options is for sharing or synchronization of your time sheet data among several computers or devices. Note that a copy of the Time Sheet program will be required on each machine that the database is intended to be imported on. Import a blank database - allows to overwrite the current time sheet database with a blank or empty one. The resulting time sheet will be analogous to what it was when you first started using the Time Sheet program. Import entire database from a file - allows to overwrite the current time sheet database with a one previously exported into a file. Use the "Browse" button on the right to specify the path to the database file being imported. The exported Time Sheet program database file is compressed into a ZIP archive file. Its file name has the date and time stamp when it was exported. Import entire database from a previous backup - allows to overwrite the current time sheet database with a one previously backed up by this copy of the Time Sheet program. You can use this option to revert to a previously backed up database. For that, make sure to select a backup from the list of available databases below. Each database file will contain the date and time stamp when the backup was performed, as well as the version of the program that made it. By default the Time Sheet program uses the Documents folder for your Windows user account to store all of its backups in the "Small Office Tools - Time Sheet - Backups" folder. Although you can change that location by clicking the "Browse" button on the right. WARNING: Changing default backup location in not recommended due to the fact that this may lead to a confusion about the location of your previous backups! The Time Sheet program is configured to automatically back up your current database before importing any external database. This is done intentionally in case the importing process fails, or if the data imported is not satisfactory. The Time Sheet program is also configured by default to back up your current database every week. This option can be changed in Preferences. IMPORTANT: It is paramount that you enable automatic backing up before importing any data! Location - allows to specify the folder path to place automatic backups in. To change the folder where the Time Sheet program places all of its automatic backups click the "Browse" button on the right. 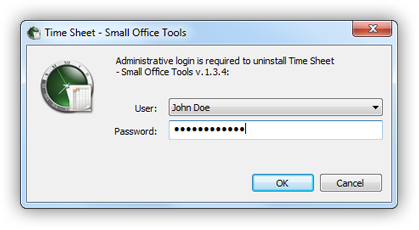 By default the Time Sheet program uses the Documents folder for your Windows user account to store all of its backups in the "Small Office Tools - Time Sheet - Backups" folder. Although you can change that location by clicking the "Browse" button. Set to a positive number, 1 and up to limit the number of stored backups to that number. Any older backups that exceed this limit will be removed. WARNING: Setting this value too low is not recommended. The recommended value for this parameter is 64 and up. Clear out, or set to 0 to allow as many previous backups as the space on the hard drive allows, without any limit. WARNING: Removing the maximum number of stored backups may result in your hard drive getting full over time. IMPORT button - starts the importing process. The Time Sheet program will show a pop-up window with the last confirmation of the database being imported. If you confirm importing, the importing process will begin. The importing may take some time, depending on the amount of information being imported. Upon completion, the entire Time Sheet program database will be overwritten with a new data. This includes all job records and employee accounts. Thus, be prepared to use administrative account login from the imported database. The settings in the Preferences window are not affected by importing a database. IMPORTANT: Make sure to allow automatic backups before importing any data! Cancel button - closes this window without importing a database. You can also invoke the Import Database window by simply dragging an exported Time Sheet program database file into the Time Sheet program window. While dragging a file for importing, make sure that the Time Sheet program is not displaying any secondary windows. Note that an administrative user login is required to export a database. Such login will be omitted if there's no administrative users currently present in the Time Sheet program database. The most useful application of the importing/exporting options is for sharing or synchronization of your time sheet data among several computers or devices. You can also use the exporting option to convert the time sheet data into other formats, such as comma-separated .csv file for importing it into any outside data processing program, such as Microsoft Excel and others. Email entire database - use this option to email the exported Time Sheet program database. A local email client is required for this option to work. The database file is compressed and attached as a ZIP file to an email message. Note that such email will not be sent without your confirmation. The resulting exported file will have the date & time stamp in its name specifying when the exporting took place. 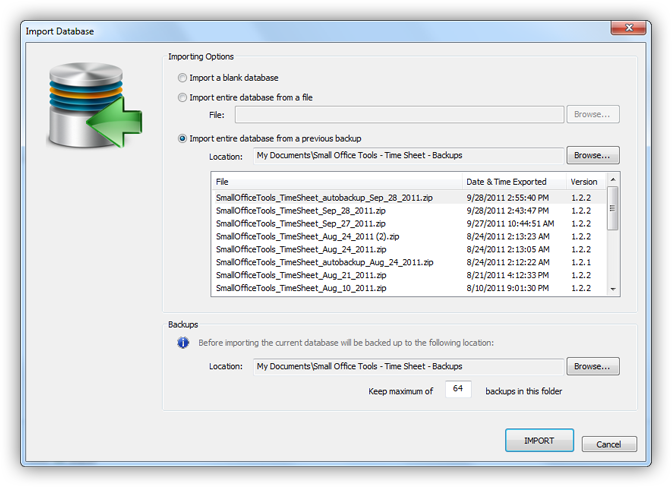 Export entire database as a file - use this option to export the Time Sheet program database into a single file. Use the "Browse" button on the right to specify the folder where to place this file in. The database file is compressed into a ZIP file. Its name will contain the date & time stamp specifying when the exporting took place. WARNING: DO NOT use this option to back up your database! The file produced will not be available for importing back into the Time Sheet program. This option is intended only for exporting the data into other programs. Export data types - various controls that allow you to specify which data you want to export. Date Range - depending on selection in other controls will allow to specify the date range to export data for. Today button - sets the date range controls to today's date. Sort By selector - specifies the type of sorting to perform before outputting the data. File field - allows to specify the location where to place the exported file. Use the "Browse" button on the right to select an existing folder. EXPORT button - starts the exporting process. Unless the "Export" option is selected, this window will close automatically when the exporting process completes. Cancel button - closes this window without exporting the database. The Preferences window allows to customize settings specific for this copy of the Time Sheet program. You can bring up the Preferences window by going to Edit -> Preferences from the main menu, or from the "More" button pop-up menu, or by using the Ctrl+K shortcut on the keyboard. Settings in the Preferences window are stored locally and are not included in an exported database. They are not affected by importing a database, either. Compact Database - clicking this button will defragment the database file that in turn will make it smaller in size, as well as faster to use. In despite of the benefits of defragmentation, you do not need to worry about using this option on a regular basis. We designed the Time Sheet program to be both fast and compact and to take care of its database integrity internally. This option is provided here for those who want to incur the function of defragmentation manually. Purge Database - allows to remove old time sheet records to free up space in the Time Sheet program database. By default the Time Sheet program does not remove any old time sheet records automatically. To do so, you need to do it manually. Note that a user login is required to purge their records from a database. If user does not have a password, leave the password field blank. By logging in as an administrator you will be able to access multiple employee accounts at once. Date Filter - specify how far back you want to begin purging time sheet records from, or select "Remove time sheet records before specified date" to enable Before date picker control that will allow you to select an arbitrary date before which to purge the time sheet records. Employees to remove time sheet records for - this list will contain names of employees available for purging the time sheet records for. Check those that you want to purge data for. In case of a logged in administrator, the list will contain a larger set of user accounts. In case of just an employee login, this list will contain their own account only. Select All - use this button to check all employees in the list. Deselect All - use this button to uncheck all employees in the list. Toggle - use this button to toggle checks for all employees in the list. All Employees - use this button to check only employee accounts in the list. All Accounting - use this button to check only accountants in the list. All Administrators - use this button to check only administrators in the list. To continue with removal make sure to type the word remove into the text field and click the "Remove" button to begin the purging process. WARNING: Removal of the time sheet records is permanent and cannot be undone later! Close button - click this button to close this window without doing the purge. First name and then the last name - example: John Doe. This setting is used by default. Do not sort - employee names will be presented in the order how they were added to the database. Sort in ascending order - employee names will be presented in ascending alphabetical order, or names starting with A, then B, then C and so on. This setting is used by default. Sorting will be performed without concern for capitalization. Sort in descending order - employee names will be presented in descending alphabetical order, or names starting with Z, then Y, then X and so on in reverse order. Require 'Enter' key to begin editing cells in the time sheet grid - if checked, will require users to hit Enter key on the keyboard to begin editing cells or columns in the time sheet controls. If unchecked, pressing other specific keyboard keys, such as digit keys for time columns; and letters, numbers or symbols for the Itemized and Comments columns, will also begin editing of those columns. Setting this option on will ensure that a random keyboard key stroke will not change the time sheet controls. Show navigation buttons for a year in the main screen - if checked, will show "<" and ">" buttons in the main window of the Time Sheet program that will allow incrementing and decrementing currently selected year. This option is disabled by default. Fill Out With Defaults - allows to fill out controls in this window with their defaults. This option does not affect controls in other tabs/pages of the Preferences window. OK button - saves changes done to all Preferences pages and closes the Preferences window. Depending on the changes applied in the Preferences window, an accountant or an administrative user login may be required to save changes. Note that changes may be rejected in case of an error. In that case you will see a pop-up message with an error description and the Preferences window will remain open. Cancel button - closes the Preferences window without saving any changes. Fill Out With Defaults - lets you fill out all controls on this page with default values. Font Name - provides the name of currently selected font that is used to generate time sheet reports. The drop-down list also provides all available fonts that can be used instead. You can use this option to style and size the employee time record report printouts. Font Size - provides the size of currently selected font (in points) to be used to generate time sheet reports. A list of suggested font sizes is provided in the drop-down list, although you're not limited to those sizes only. You may also specify a fractional font size, if your web browser supports it. Table Spacing - lets you specify the inner spacing of cells in the time sheet report table in pixels, or how far apart each cell is. A list of suggested spacing values is provided in the drop-down list, although you're not limited to those values only. Delineate weeks with thicker line in time sheet printouts - if checked, will add a slightly thicker line between weeks in the employee time record report printout. If unchecked, no line will be added. Include date & time of printing on printouts - if checked, will add the line, "Printed: <Date & Time>" at the bottom of each employee time record report printout. 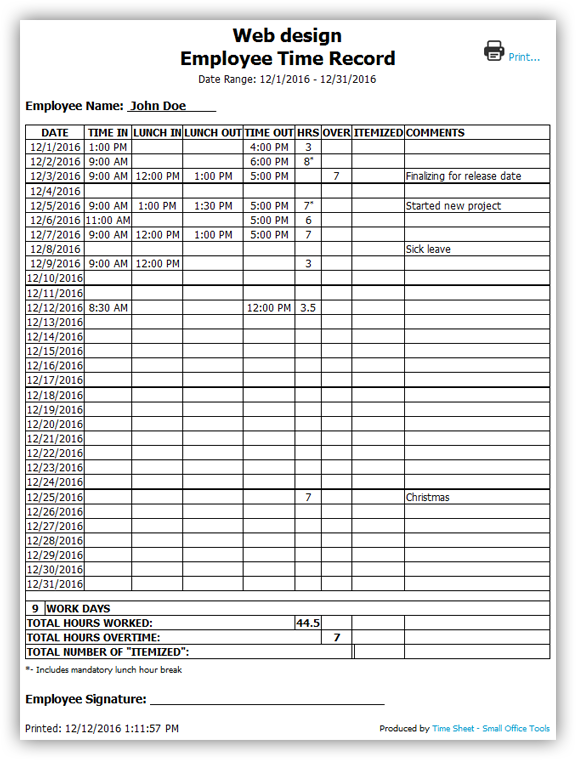 Fill out Comments column in time sheet - if checked, will fill out the Comments column with the time sheet data when printing the employee time record report printout. If not checked, the Comments column will remain empty in the printout. Use this option to avoid printing comments in the time sheet controls. Check time sheet for errors before printing - if checked, will perform consistency checks of the work hours in time sheets before printing the employee time record report, and will issue a warning if such check doesn't pass. While performing consistency checks, the Time Sheet program looks for day lines where it was not able to calculate work hours without ambiguities. It is strongly recommended to keep this option on. 10:00 AM 3:00 PM 4:00 PM 1:00 PM Warning: Lunch must be within a working day. Default web browser - Time Sheet program will use your default web browser that is set up for your Windows user account. Default application - Time Sheet program will use you default application that is set up for your Windows user account. Time Sheet program saves its reports as files with .htm extension. Internet Explorer - Time Sheet program will use Internet Explorer. Built-in Viewer - will open reports in Time Sheet program's own viewer to ensure compatibility between different operating systems and user settings. Default Present As - this control allows to specify default selection for "Present As" control that is used for printing time sheet reports. CSV Files section contains controls that are used to define parameters for saving time sheet reports as text files in the format with Comma-Separated Values (CSV). Such format is supported by spreadsheet applications, such as Microsoft Excel. ANSI - file encoding that uses 8 bits per character for saving text. WARNING: Using ANSI file encoding for saving data with non-English characters may lead to the loss of data! Because of that the use of this encoding is highly discouraged. UTF-8 - file encoding that uses variable number of bits per character for saving text. This encoding may not be supported by some versions of Microsoft products. Unicode-16 - file encoding that uses 16 bits per character for saving text. This encoding is used by default since it is widely supported by Microsoft Excel. Add delimiter hint - when checked will add a special line on top of the CSV file that will convey the "cell delimiter" that was used in that CSV file. It is recommended to check this option if your spreadsheet application supports it. INFO: Because CSV file is just a text file, "cell delimiter" character is used to separate data cells in it, as if it was a "line" in the data table. Logically you would want to pick a character that is not used too often in the data itself. 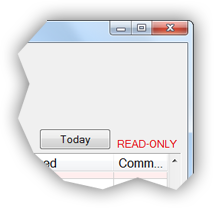 By default, many spreadsheet applications use tab, comma, or semicolon as a "cell delimiter" when reading CSV files. User-Defined - will use whatever set of characters are defined as the "cell delimiter" in the Windows Control Panel for the currently logged in Windows user. The current "cell delimiter" character will be shown in the name of this menu item in parentheses. Comma (,) - will use comma (,) as the "cell delimiter". Semicolon (;) - will use semicolon (;) as the "cell delimiter". Tab - will use tab as the "cell delimiter". This option is used by default since it is widely supported by Microsoft Excel. Custom - will enable control on the right that will allow you to specify your own "cell delimiter" character(s). Although you're allowed to specify up to 3 characters for the "cell delimiter", keep in mind that some spreadsheet applications may not support it. Columns (Used) - list of columns that will be used when generating CSV files with time sheet reports. "<" button - allows you to add a new column to be used for generation of CSV files with time sheet reports. Before using this button, make sure to select the column you want to add in the list on the right. ">" button - allows you to remove a column from being used for generation of CSV files with time sheet reports. Before using this button, make sure to select the column you want to remove in the list on the left. Columns (Available) - list of columns that are currently not used when generating CSV files with time sheet reports. By default the Time Sheet program will fill out the holiday list on this page with holidays specific for your location. In case this list is empty, this means that the Time Sheet program does not support your location yet. We encourage you to fill out the list of holidays manually and later submit it to our developers for inclusion into future versions of the program. We also encourage you to make any corrections to the holiday list that you deem necessary. Please provide us with an update in that case as well. Currently Defined Holidays section - contains the list of the currently defined holidays for your location. To be able to edit a holiday entry, select it first by left-clicking it with the mouse. All entries in the holiday list are sorted by date. Only one holiday of the same date type can be defined per single calendar date. "+" button - adds a new blank holiday entry to the list of the currently defined holidays. "-" button - removes selected holiday entry from the list of the currently defined holidays. Reset Holidays to Default - resets all the entries in the list of the currently defined holidays to predefined holidays. This is a pop-up list that contains holidays specific for your location. A warning will be issued before the holidays list is reset. To complete the change make sure to OK the Preferences window. Load Holidays - displays the Open File dialog window that lets you select a file containing holidays previously saved by the Time Sheet program. 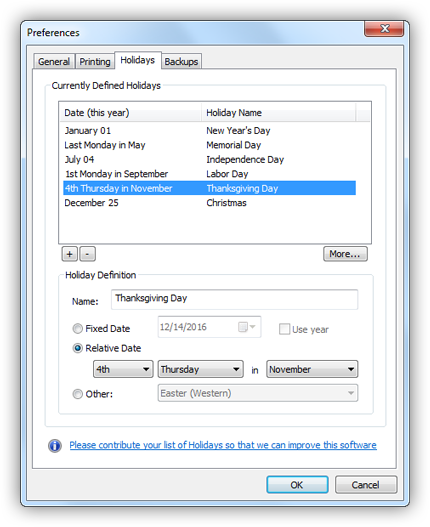 You can use this option to store previously defined holidays in a file, as well as to exchange or populate a set of holidays among several installations of the Time Sheet program. The default file extension used by this file type is .holi. Loading holidays from a file will overwrite all holidays in the list of the currently defined holidays. Save Holidays - displays the Save File As dialog window that lets you select a location to save all holidays in the list of the currently defined holidays into a single file. Contribute Your Holiday List For Developers - this option allows you to send your list of the currently defined holidays to our developers for inclusion, or correction in a future version of the Time Sheet program. We encourage you to use this option to improve this software. When activated the Time Sheet program will collect and archive your defined holidays and attach it to an email message using your default email client. NOTE that such email will not be sent without your permission. The Time Sheet program does not collect your personal information in the holiday list file. You can also submit your list of holidays using the Save Holidays command above. In that case please attach the resulting file in your email to us. Name - contains a holiday name. It is recommended that you specify a holiday name as a concise holiday description. This name will appear in the Comments column of the time sheet controls and time sheet printouts. Fixed Date - check this box if a holiday can be defined by a fixed date. When checked, a date picker control will be available as well. An example of a holiday with the fixed date could be the New Year's Day that always falls on January 1st. Use year - when checked, will define a holiday fixed for a specific year. If unchecked, only month and day of a fixed-date holiday will be used to define it. Relative Date - check this box if a holiday can be defined by a relative date. An example of a holiday with the relative date could be Thanksgiving, celebrated in the United States on the 4th Thursday in November. It is called relative because it may fall on different calendar days. Relative Date Selection controls - let you specify a relative holiday. Select a succession of parameters in the drop-down controls to define a relative holiday. Other - check this box if a holiday definition does not match any other ones described above. A drop-down control on the right provides a list of special holidays that you can choose from. 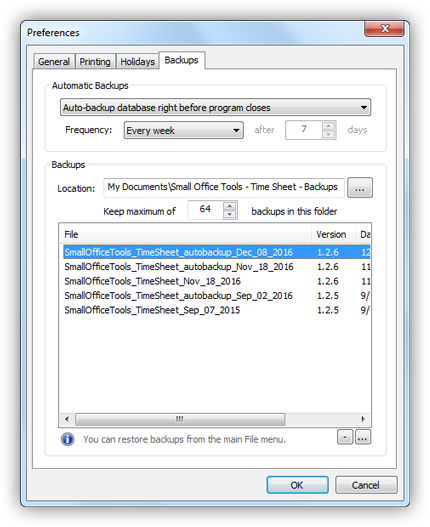 Backups page contains settings that control automatic backing up of the Time Sheet program database, as well as the location where to place those backups, and other backup related settings. Auto-backup database right before program closes - when selected, the Time Sheet program will perform automatic backups of its database right before it's closed, according to other parameters specified in this section. Frequency - use this drop-down list to specify the frequency of automatic backups, or pick Other to enable the `after` control that will let you specify an arbitrary number of days after which to perform an automatic backup. To restore any of the previous backups go to File -> Restore From Backup in the main menu. Location - allows to specify the folder path to save backup files to. Use the "..." button on the right to choose the backup folder using "Browse for Folder" dialog. By default the Time Sheet program saves backups to the "Documents\Small Office Tools - Time Sheet - Backups" folder. File - shows file name given to the backup. Version - shows version number of the backup. Date & Time Backed Up - shows when the backup was performed. Rename Backup - shows a pop-up window that allows to rename selected backup file. This command is available only when a single backup is selected in the list. Delete Backups - permanently removes selected backup files. WARNING: Once removed there will be no way to revert deleted backup files! "-", or Delete backups button - permanently removes selected backup files. "...", or Rename backup button - shows a pop-up window that allows to rename selected backup file. Version displays the current version number of your copy of the program. Additionally this line will denote your copy of the program as being a Desktop or a Windows Store version of the app. Buy Copy button (in case of a trial, or demo copy) lets you buy your copy of the Time Sheet program. De-authorize button (in case of a purchased copy) lets you de-authorize this copy of the Time Sheet program. This is required in case you decide to move your copy of the Time Sheet program to another computer. In this case you are required to de-authorize, or remove the registration license from the old computer. Note that the Time Sheet program license allows you to register only a specific number of copies of the Time Sheet program, which is detailed in your purchased license. De-authorizing your copy of the Time Sheet program will remove the registration license and then close the program. Restarting the Time Sheet program from the same Windows user account will most certainly display a message that your copy has expired. In case you decide to reinstall your copy of the Time Sheet program on the same computer you are allowed to re-use the same registration license, provided that you de-authorized all other copies of the program to satisfy terms of your purchased license. De-authorizing is not available in a Windows Store version of the app. Thank you for using the Time Sheet app! We're actively working on improving the Time Sheet software and welcome any feedback from its users.